In this week's Summer Bloggin' post, we have the first part in a series of two that is all about stabilizers. 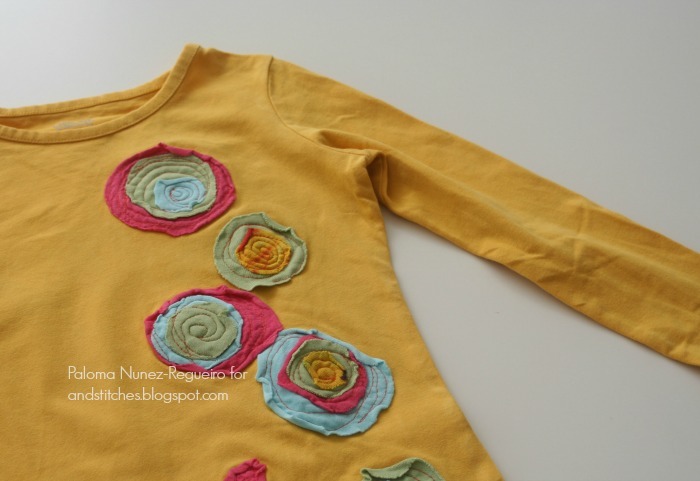 We all know how frustrating stretchy or slinky fabric can be to stitch on, but what type of stabilizer should you use? Paloma investigates for us! Paloma writes the blog Three Kitchen Fairies. 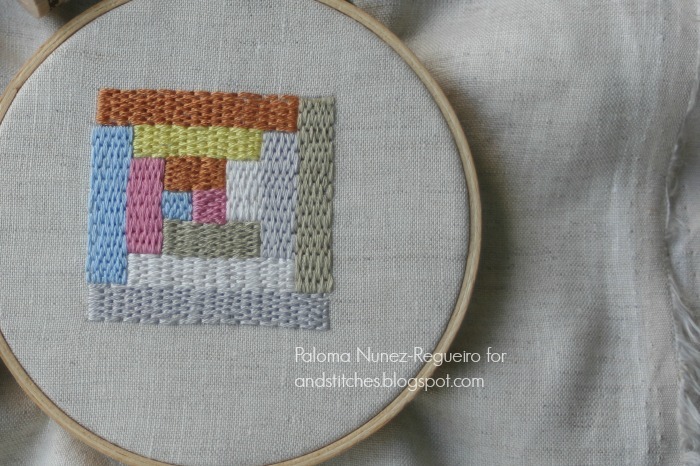 Here she shares her sewing and embroidery projects as well as her adventures living in Mexico. Paloma also has a shop where you can find her embroidery patterns as well other goodies. Hi there, I'm Paloma from Three Kitchen Fairies. Thank you to the &Stitches team for letting me post this with them summer. 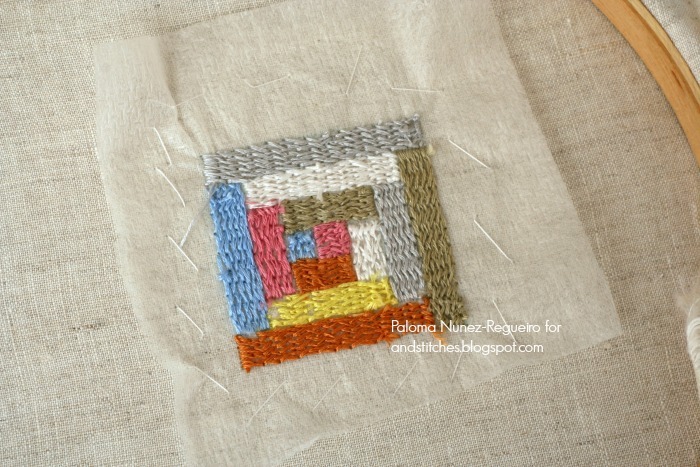 Today I'm sharing my experience with embroidery stabilizers. To me, embroidery goes beyond fabric, needle, and embroidery floss. It's more than a pretty pattern, and the pretty colors we choose to work with. 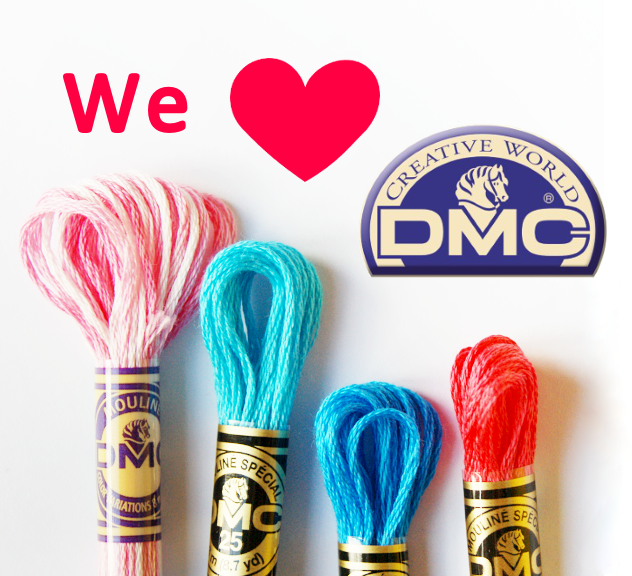 The ease to get the needle from one side of the fabric to the other, the relationship between the embroidery floss and the quality of fabric is also important to get the best results. Have you ever fallen in love with a certain fabric?? And you assure yourself it will go perfectly with that embroidery pattern you bought on-line? Then you realize that your stitches are not turning out the way they should. 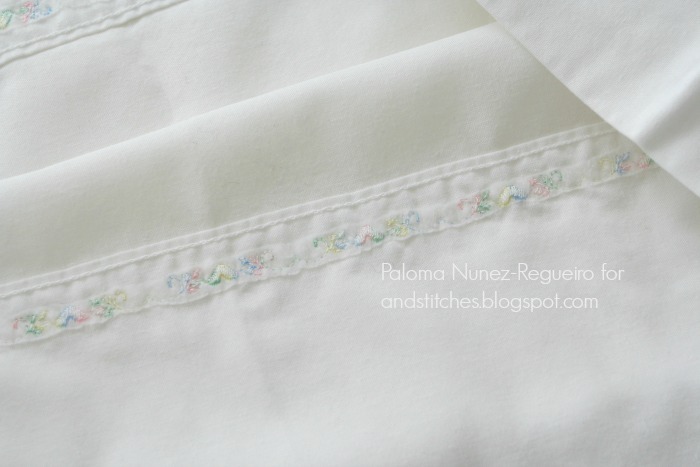 When it comes to embroidery, I wish most fabrics were just as nice as quilters cotton. Many times I have come across fabrics that are a bit hard to embroider. A few times I've given up on a stitchery pieces because the low count of thread on the fabric, or the stretchiness of the fabric like jersey knits for example. It is at times like these that stabilizers come into play. Embroidery stabilizers help your fabric have the necessary quality to form perfect embroidery stitches. There is an ample variety of stabilizer to mix and match with your favorite fabrics: cut-away, tear-away, heat 'n bond, and wash-away. Most embroidery stabilizers are made of fiber based material, they're usually used for machine embroidery. Stabilizers open a new world of possibilities to me, I've tried them over and over again, not only for machine embroidery but also for hand embroidery. One of my favorite stabilizers is Sulky's Soft'n Sheer cut-away, permanent stabilizer. This is a lightweight non-woven stabilizer. I use it with fabrics that are a bit thinner that the usual quilters cotton, or weaver's cloth like: linen, bed sheets, or even flour sacks. You can use it both ways: with the stabilizer and the fabric together in the hoop to have the taut enough, or just baste the exact amount to the back of your project. Linen is for me one of those fabrics that are hard to stitch on. For linen I like to use a permanent stabilizer on the back. If I don't use a stabilizer, my stitches are either too tight or too loose. Sometimes I can even see through the little hole left by the needle if I hold my hoop in front of the light. The fact that the stabilizer is a non-woven material allows my stitches to stay exactly where I want them to. It also helps the fabric fibers to stay in place. When the embroidery pattern is smaller than the embridery hoop, I cut the right amount of stabilizer and baste it to the back of the embroidery pattern so that it stays in place. This way I can reduce the amount of stabilizer material I use. 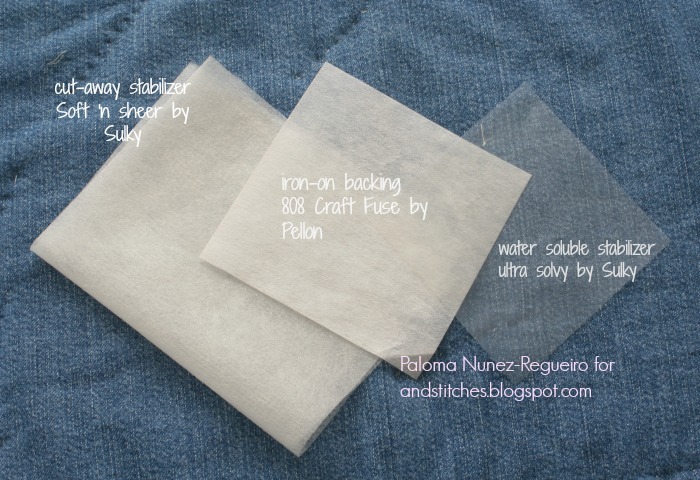 Another material I specially like using as stabilizer for machine embroidery is Pellon interfacing. You can find it in different weights, from lightweight to a heavyweight that is almost like card stock! I just pin it in place to the fabric to be embroidered and it helps avoid puckering on the back. The remaining material can be removed or left in place. 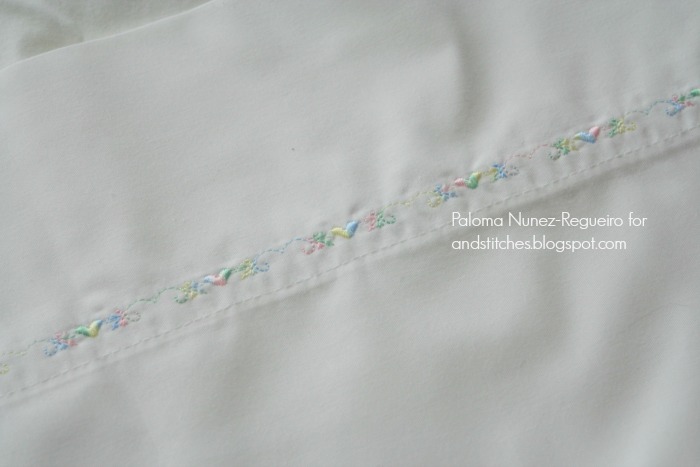 I used this method for embroidering bedsheets, and for free motion embroidery as well. In case you were wondering, I did not use a hoop. 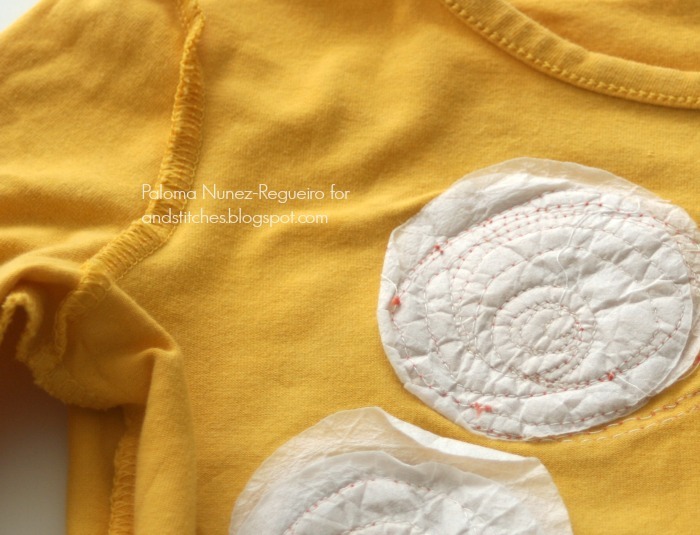 Next week I will share my experiences with stabilizers and knit / T-shirt fabrics. What are your experiences with stabilizers? Do you have any favourites? Thanks for this. I'm still pretty new and I find that I have the same thing happen with some linens. I've used muslin once simply because that's what I had here. It was okay, but these look better.